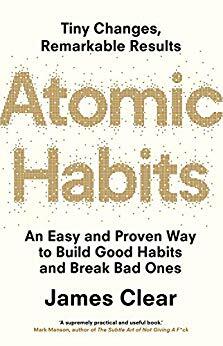 This is one of the most useful book on changing your habits, more than The Power of Habit by Charles Duhigg. I’d recommend this book over most books aimed at helping you get control over your life. Your outcomes are a lagging measure of your habits. Your net worth is a lagging measure of your financial habits. Your weight is a lagging measure of your eating habits. Your knowledge is a lagging measure of your learning habits. Your clutter is a lagging measure of your cleaning habits. You get what you repeat. Goals are about the results you want to achieve. Systems are about the processes that lead to those results. Goals are good for setting a direction, but systems are best for making progress. Winners and losers have the same goals. Achieving a goal is only a momentary change. Goals are at odds with long-term progress. The purpose of setting goals is to win the game. The purpose of building systems is to continue playing the game. You do not rise to the level of your goals. You fall to the level of your systems. We try to change the wrong thing. We try to change our habits in the wrong way. The first layer is changing your outcomes. This level is concerned with changing your results: losing weight, publishing a book, winning a championship. Most of the goals you set are associated with this level of change. The second layer is changing your process. This level is concerned with changing your habits and systems: implementing a new routine at the gym, decluttering your desk for better workflow, developing a meditation practice. Most of the habits you build are associated with this level. The third and deepest layer is changing your identity. This level is concerned with changing your beliefs: your worldview, your self-image, your judgments about yourself and others. Most of the beliefs, assumptions, and biases you hold are associated with this level. The alternative is to build identity-based habits. With this approach, we start by focusing on who we wish to become. Behavior that is incongruent with the self will not last. You may want more money, but if your identity is someone who consumes rather than creates, then you’ll continue to be pulled toward spending rather than earning. Nail biting: “I asked my wife to schedule my first-ever manicure,” he said. “My thought was that if I started paying to maintain my nails, I wouldn’t chew them. And it worked, but not for the monetary reason. What happened was the manicure made my fingers look really nice for the first time. The manicurist even said that—other than the chewing—I had really healthy, attractive nails. Suddenly, I was proud of my fingernails. The ultimate form of intrinsic motivation is when a habit becomes part of your identity. It’s one thing to say I’m the type of person who wants this. It’s something very different to say I’m the type of person who is this. New identities require new evidence. If you keep casting the same votes you’ve always cast, you’re going to get the same results you’ve always had. If nothing changes, nothing is going to change. It is a simple two-step process: Decide the type of person you want to be. Prove it to yourself with small wins. The formation of all habits is a feedback loop (a concept we will explore in depth in the next chapter), but it’s important to let your values, principles, and identity drive the loop rather than your results. The focus should always be on becoming that type of person, not getting a particular outcome. You do not crave smoking a cigarette, you crave the feeling of relief it provides. You are not motivated by brushing your teeth but rather by the feeling of a clean mouth. You do not want to turn on the television, you want to be entertained. Every craving is linked to a desire to change your internal state. The thoughts, feelings, and emotions of the observer are what transform a cue into a craving. The response is the actual habit you perform, which can take the form of a thought or an action. Whether a response occurs depends on how motivated you are and how much friction is associated with the behavior. Rewards are the end goal of every habit. The cue is about noticing the reward. The craving is about wanting the reward. The response is about obtaining the reward. The first purpose of rewards is to satisfy your craving. Second, rewards teach us which actions are worth remembering in the future. If a behavior is insufficient in any of the four stages, it will not become a habit. Eliminate the cue and your habit will never start. Reduce the craving and you won’t experience enough motivation to act. Make the behavior difficult and you won’t be able to do it. And if the reward fails to satisfy your desire, then you’ll have no reason to do it again in the future. Without the first three steps, a behavior will not occur. Without all four, a behavior will not be repeated. The problem phase includes the cue and the craving, and it is when you realize that something needs to change. The solution phase includes the response and the reward, and it is when you take action and achieve the change you desire. you don’t need to be aware of the cue for a habit to begin. You can notice an opportunity and take action without dedicating conscious attention to it. We need a “point-and-call” system for our personal lives. That’s the origin of the Habits Scorecard, which is a simple exercise you can use to become more aware of your behavior. Make a list of your daily habits. If it is a good habit, write “+” next to it. If it is a bad habit, write “–”. If it is a neutral habit, write “=”. The first step to changing bad habits is to be on the lookout for them. If you feel like you need extra help, then you can try Pointing-and-Calling in your own life. Say out loud the action that you are thinking of taking and what the outcome will be. they were also asked to formulate a plan for when and where they would exercise over the following week. Specifically, each member of the third group completed the following sentence: “During the next week, I will partake in at least 20 minutes of vigorous exercise on [DAY] at [TIME] in [PLACE].”… 91 percent of the third group exercised at least once per week—more than double the normal rate. The sentence they filled out is what researchers refer to as an implementation intention, which is a plan you make beforehand about when and where to act. That is, how you intend to implement a particular habit. Many people think they lack motivation when what they really lack is clarity. It is not always obvious when and where to take action. Some people spend their entire lives waiting for the time to be right to make an improvement. The simple way to apply this strategy to your habits is to fill out this sentence: I will [BEHAVIOR] at [TIME] in [LOCATION]. The Diderot Effect states that obtaining a new possession often creates a spiral of consumption that leads to additional purchases. Habit stacking: identify a current habit you already do each day and then stack your new behavior on top. Make a list with two columns. In the first column, write down the habits you do each day without fail. In the second column, write down all of the things that happen to you each day without fail. Armed with these two lists, you can begin searching for the best place to layer your new habit into your lifestyle. Habits like “read more” or “eat better” are worthy causes, but these goals do not provide instruction on how and when to act. Be specific and clear: After I close the door. After I brush my teeth. After I sit down at the table. The specificity is important. The more tightly bound your new habit is to a specific cue, the better the odds are that you will notice when the time comes to act. habits can be easier to change in a new environment. It helps to escape the subtle triggers and cues that nudge you toward your current habits. Go to a new place—a different coffee shop, a bench in the park, a corner of your room you seldom use—and create a new routine there. “disciplined” people are better at structuring their lives in a way that does not require heroic willpower and self-control. In other words, they spend less time in tempting situations. I have never seen someone consistently stick to positive habits in a negative environment. One of the most practical ways to eliminate a bad habit is to reduce exposure to the cue that causes it. Remove a single cue and the entire habit often fades away. The more attractive an opportunity is, the more likely it is to become habit-forming. When it comes to habits, the key takeaway is this: dopamine is released not only when you experience pleasure, but also when you anticipate it. Gambling addicts have a dopamine spike right before they place a bet, not after they win. It is the anticipation of a reward—not the fulfillment of it—that gets us to take action. After [CURRENT HABIT], I will [HABIT I NEED]. After [HABIT I NEED], I will [HABIT I WANT]. If you want to watch sports, but you need to make sales calls: After I get back from my lunch break, I will call three potential clients (need). After I call three potential clients, I will check ESPN (want). The hope is that eventually you’ll look forward to calling three clients or doing ten burpees because it means you get to read the latest sports news or check Facebook. Join a culture where (1) your desired behavior is the normal behavior and (2) you already have something in common with the group. The normal behavior of the tribe often overpowers the desired behavior of the individual. For example, one study found that when a chimpanzee learns an effective way to crack nuts open as a member of one group and then switches to a new group that uses a less effective strategy, it will avoid using the superior nut cracking method just to blend in with the rest of the chimps. Your habits are modern-day solutions to ancient desires. New versions of old vices. The underlying motives behind human behavior remain the same. The specific habits we perform differ based on the period of history. Even the tiniest action is tinged with the motivation to feel differently than you do in the moment. When you binge-eat or light up or browse social media, what you really want is not a potato chip or a cigarette or a bunch of likes. What you really want is to feel different. Find something that makes you truly happy—like petting your dog or taking a bubble bath—and then create a short routine that you perform every time before you do the thing you love. Maybe you take three deep breaths and smile. Three deep breaths. Smile. Pet the dog. Repeat. Eventually, you’ll begin to associate this breathe-and-smile routine with being in a good mood. If you want to master a habit, the key is to start with repetition, not perfection. You don’t need to map out every feature of a new habit. You just need to practice it. This is the first takeaway of the 3rd Law: you just need to get your reps in. One of the most common questions I hear is, “How long does it take to build a new habit?” But what people really should be asking is, “How many does it take to form a new habit?” That is, how many repetitions are required to make a habit automatic? Habits like scrolling on our phones, checking email, and watching television steal so much of our time because they can be performed almost without effort. They are remarkably convenient. One of the most effective ways to reduce the friction associated with your habits is to practice environment design. when deciding where to practice a new habit, it is best to choose a place that is already along the path of your daily routine. Habits are easier to build when they fit into the flow of your life. create an environment where doing the right thing is as easy as possible. Resetting the room: For instance, when he finishes watching television, he places the remote back on the TV stand, arranges the pillows on the couch, and folds the blanket. If you find yourself watching too much television, for example, then unplug it after each use. Only plug it back in if you can say out loud the name of the show you want to watch. When I hide beer in the back of the fridge where I can’t see it, I drink less. When I delete social media apps from my phone, it can be weeks before I download them again and log in. Your options are constrained by what’s available. They are shaped by the first choice. A new habit should not feel like a challenge. The actions that follow can be challenging, but the first two minutes should be easy. What you want is a “gateway habit” that naturally leads you down a more productive path. Your goal might be to run a marathon, but your gateway habit is to put on your running shoes. That’s how you follow the Two-Minute Rule. Be home by 10 p.m. every night. Have all devices (TV, phone, etc.) turned off by 10 p.m. every night. Be in bed by 10 p.m. every night (reading a book, talking with your partner). Lights off by 10 p.m. every night. Wake up at 6 a.m. every day. Stories like these are evidence of the Cardinal Rule of Behavior Change: What is rewarded is repeated. What is punished is avoided. You learn what to do in the future based on what you were rewarded for doing (or punished for doing) in the past. Positive emotions cultivate habits. Negative emotions destroy them. One solution is to turn the situation on its head. You want to make avoidance visible. Open a savings account and label it for something you want—maybe “Leather Jacket.” Whenever you pass on a purchase, put the same amount of money in the account. Skip your morning latte? Transfer $5. Pass on another month of Netflix? Move $10 over. It’s like creating a loyalty program for yourself. One of my readers and his wife used a similar setup. They wanted to stop eating out so much and start cooking together more. They labeled their savings account “Trip to Europe.” Whenever they skipped going out to eat, they transferred $50 into the account. In summary, a habit needs to be enjoyable for it to last. Simple bits of reinforcement—like soap that smells great or toothpaste that has a refreshing mint flavor or seeing $50 hit your savings account—can offer the immediate pleasure you need to enjoy a habit. And change is easy when it is enjoyable. Never miss twice. The first mistake is never the one that ruins you. It is the spiral of repeated mistakes that follows. The more immediate the pain, the less likely the behavior. If you want to prevent bad habits and eliminate unhealthy behaviors, then adding an instant cost to the action is a great way to reduce their odds. As soon as actions incur an immediate consequence, behavior begins to change. Customers pay their bills on time when they are charged a late fee. Students show up to class when their grade is linked to attendance. We’ll jump through a lot of hoops to avoid a little bit of immediate pain. habit contract can be used to add a social cost to any behavior. It makes the costs of violating your promises public and painful. Fill out the Habits Scorecard. Write down your current habits to become aware of them. Design your environment. Make the cues of good habits obvious and visible. Use temptation bundling. Pair an action you want to do with an action you need to do. Join a culture where your desired behavior is the normal behavior. Create a motivation ritual. Do something you enjoy immediately before a difficult habit. Reduce friction. Decrease the number of steps between you and your good habits. Prime the environment. Prepare your environment to make future actions easier. Master the decisive moment. Optimize the small choices that deliver outsized impact. Use the Two-Minute Rule. Downscale your habits until they can be done in two minutes or less. Automate your habits. Invest in technology and onetime purchases that lock in future behavior. Use reinforcement. Give yourself an immediate reward when you complete your habit. Make “doing nothing” enjoyable. When avoiding a bad habit, design a way to see the benefits. Never miss twice. When you forget to do a habit, make sure you get back on track immediately. 1. Reduce exposure. Remove the cues of your bad habits from your environment. 1. Reframe your mind-set. Highlight the benefits of avoiding your bad habits. 1. Increase friction. Increase the number of steps between you and your bad habits. 2. Use a commitment device. Restrict your future choices to the ones that benefit you. 1. Get an accountability partner. Ask someone to watch your behavior. 2. Create a habit contract. Make the costs of your bad habits public and painful. The greatest threat to success is not failure but boredom. We get bored with habits because they stop delighting us. The outcome becomes expected. And as our habits become ordinary, we start derailing our progress to seek novelty. You need just enough “winning” to experience satisfaction and just enough “wanting” to experience desire. This is one of the benefits of following the Goldilocks Rule. If you’re already interested in a habit, working on challenges of just manageable difficulty is a good way to keep things interesting. I know of executives and investors who keep a “decision journal” in which they record the major decisions they make each week, why they made them, and what they expect the outcome to be. They review their choices at the end of each month or year to see where they were correct and where they went wrong. What are the core values that drive my life and work? How am I living and working with integrity right now? How can I set a higher standard in the future?